Building great bike paths that are inviting for all is an inclusive thing to do. And within that inclusion, the numbers of cyclists can grow across a broad spectrum of people. A recent City Lab post from urban-planning rock star Jeff Speck outlines a few steps for fixing “badly planned” American cities. One of the steps is to “understand that cycling follows investment” – which means that investment in great, well-connected routes for bikes will generate more cycling activity in a city. That’s right, Macon, Georgia is a paragon of success in terms of demonstrating the benefits of bike infrastructure. Anyone who’s spent time there knows that it’s just as hilly and Atlanta and just as hot n the summer, if not more so. And while Macon and Atlanta will never be Copenhagen when it comes to the percentage of trips made on bicycles. But there’s a huge space between the status quo and Copenhagen-level utopia, and we can definitely close that gap by making big gains in bike trips. Why is it so important for us to try to close that gap? Consider that vehicle emissions now the biggest source of climate-harming CO2 emissions in the U.S., and that there’s new data showing that electric cars aren’t necessarily cleaner than gasoline engines throughout the battery cycle. Couple those two things with the fact that Atlanta’s population is set to increase dramatically, and it’s clear that getting people out of cars and on bikes (and using transit and walking) makes good sense. A great cartoon from Ryan Martinson illustrates this point clearly: if we build weak bike infrastructure when stronger infrastructure is needed (largely due to the dangers of car speeds), only the bravest cyclists will use it regularly. And that’s a limited number that excludes the non-brave. What’s ‘weak infrastructure’? Think of narrow bike lanes with no barrier on streets where cars drive fast, and think of bike lanes that only last for a few blocks without connecting to a network of safe routes. Meanwhile, naysayers who don’t feel that the expansion of cycling is important can point to that low usage on that weak infrastructure and say “See? Hardly anyone bikes here. There’s no need to build a better network of bike lanes or to slow down car traffic.” But if we go ahead and build great infrastructure that’s inviting for all people, that’s more inclusive thing to do. And within that inclusion, the numbers of cyclists can grow across a broad spectrum of people. And really, the same could be said of sweaty Atlanta, where people say “let’s face it, everyone drives here” as if things could never change and it will never be a biking/walking city. Despite the doubters, when we put down miles of welcoming BeltLine path, tons of people bike and walk on it in big numbers even in summer heat. If you’re the kind of person who needs data to back up these claims that cycling growth follows investment, it exists. A 2012 study published in the journal Transportation looked at bike commuting in 90 U.S. cities to examine the influence that bike infrastructure has on commuter cycling rates. The study found that environmental factors like weather and sprawl don’t prevent people from cycling as long as bike lanes & paths exist. …cities with more bike paths and lanes have significantly higher rates of bike commuting, even when factors that influence cycling rates – such as weather, cycling safety, degree of sprawl, and the price of gasoline – are taken into account. All of this ties in with the well-publicized concerns about stalled Complete Streets projects in Atlanta, which would supply new bike lanes (and more). Over three years have passed since a referendum passed that funds those Renew Atlanta projects, yet only one of the promised 16 Complete Streets has been built, and timelines on all of them continually get pushed back. 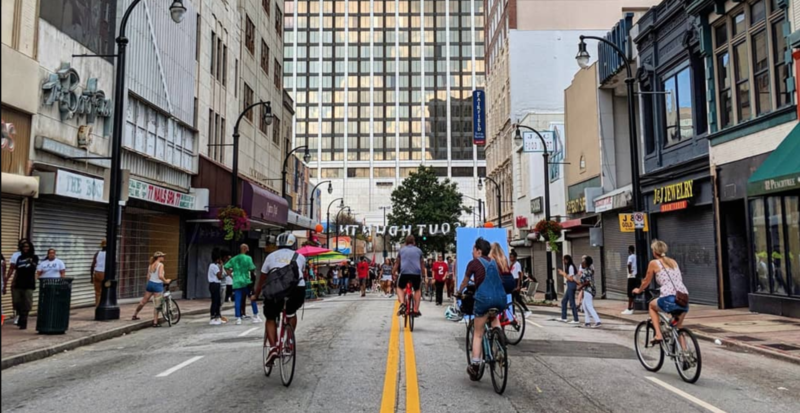 Mayor Keisha Lance Bottoms and Atlanta’s City Council representatives should work to get these Complete Streets prioritized with the Renew Atlanta spending. We’ve got data, local evidence, and planning gurus all pointing the way to growth in cycling in the city if we can get the infrastructure right, heat and hills be damned.